“How do I make the pain stop?” Millions of people in the United States suffering from neck, shoulder, and jaw pain ask this question to their physicians receiving unsatisfactorily results. Did you know that the answer may rest in the hands of your TMJ specialist dentist in Chandler? Read on to learn what TMJ disorder is and how to free your life from the pain. HOW DOES A TMJ SPECIALIST ELIMINATE PAIN? Since TMJ disorder is a chronic degenerative disease that usually develops over years of improper bite alignment and stress, the most effective way of treating it and eliminating the root cause of your pain is by modifying your bite alignment. Watch the following video to learn how Dr. Walker’s expertise in neuromuscular dentistry can help. 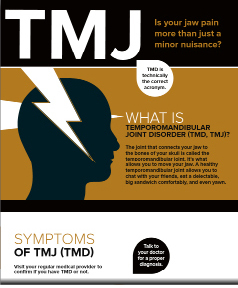 Download your free copy of our TMJ infographic where you will learn more about your treatment options! Courtesy of your TMJ specialist in Chandler, Dr. Walker. Dr. Walker has the advanced neuromuscular training to satisfactorily diagnose and treat TMJ disorder. As your specialist neuromuscular dentist in the Chandler area, he can help bring balance to the joints and muscles in your jaw by determining the proper resting position of the jaw and restoring optimal comfort and function. How? By using state-of-the-art TENS therapy and EMG and jaw tracking technology. This advanced technology uses electro-signaling pulses to map out the function and alignment of your jaw and bite. This information coupled with restorative dentistry and bite alignment treatment has worked marvelously in giving patients the relief they dream of. Come see Dr. Walker to eliminate the root cause of your jaw pain and migraines. What treatment option do you prefer to eliminate the TMJ pain, one-time restorative dentistry or progressive bite alignment treatment?